On Friday the 20th, we began the vacation day with a walk out to Bar Island. 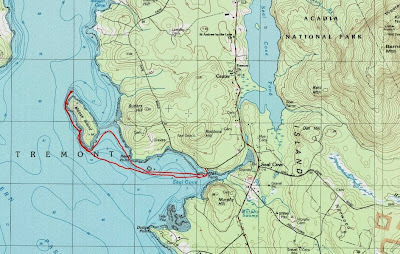 Bar Island is the island immediately north of Bar Harbor that is reachable via a sand bar at low tide. Low tide was at 5:46 AM, so the timing was perfect to take a walk out there and catch sunrise from the bar. From the island we saw the first rays of light hitting Bar Harbor. Once again it was a clear morning. 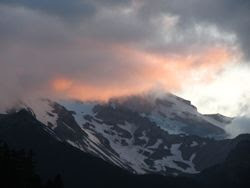 We chatted with a man from North Carolina who was out on the bar also enjoying the sunrise. Once back in Bar Harbor, we paid our 2nd visit to Jeannie's Great Maine Breakfast. The town was much less crowded on Friday than it was on Tuesday morning. Perhaps there were less people from cruise ships milling about. In any case, we had another great breakfast and then got out of town. We headed over to the quiet west side of the island on Route 102 to the hamlet of Pretty Marsh where we followed Bartlett’s Landing Road to the boat launch for Bartlett Narrows. This would be our launch spot for the morning. I had launched here perhaps 8 years ago with my son. On that day we saw harbor seals during our paddle. 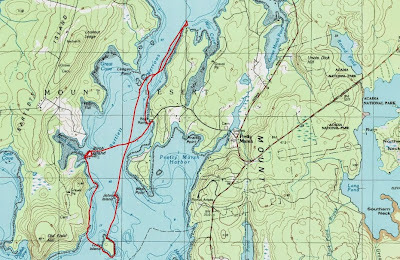 After we launched today, we paddled north to the top of the narrows. We should have paddled north to the Hub, or past Green Island to the Ledge, but I couldn’t recall at the time where we had the best chance of finding seals. 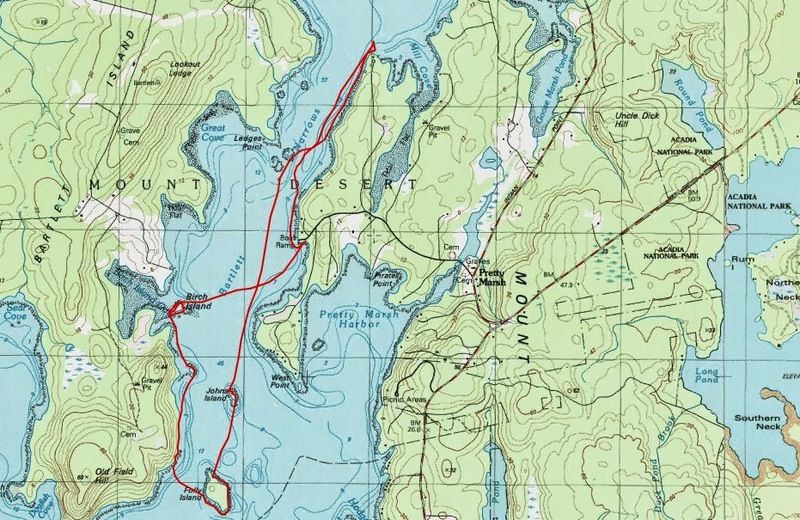 Instead, we turned and paddled southward past our launch spot until we came to John Island. We circled the island and found a nice spot to land on the north side. I wasn’t sure if the island was private or public, but there were no signs visible from the water. As we scampered up onto the island, I found a sign indicating that the island was owned by the State and it is administered by the Maine Island Trail Association (MITA). Camping is allowed. John Island is a small island and MITA suggests that it be used by 2 only people at a time, occupying 1 tent. There is a nice grassy spot on the south center of the island, suitable for camping. The island is mostly scrub with 3 trees at the northeast end. There are no coves, but there are a couple rocky knolls to sit and enjoy the view and the water. It was warming up nicely, and I took a moment to put on some sunscreen. 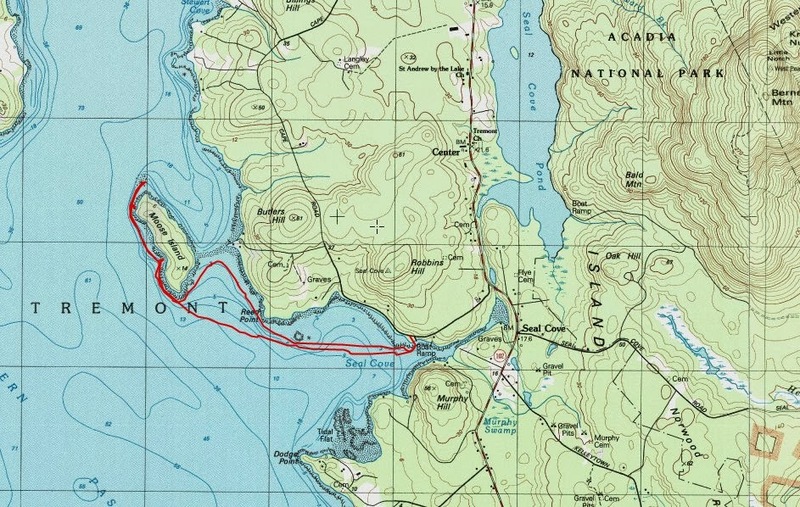 From John Island, we continued paddling south to Folly Island. At Folly, we saw a sign indicating that the island was open, but for day use only. We paddled around the island, but didn’t get out of the boats. From the water, the only part of the island that looked inviting was the southwest corner, where there was a small meadow and some spruce trees. We headed north at this point to return to the launch. On the way back we hugged the eastern side of Bartlett Island and we circled around the small Birch Island. No signs were sign and we stayed in the boats. It looked thick with trees. Back at the launch, we loaded the boats and went back to Seawall Campground, where we were staying. We cooked some dinner and then decided to go back in the boats rather than do an evening hike. This time we launched from Seal Cove, which is a few miles south of Bartlett’s Landing. It was 5 PM when we were launching, so we really only had time for a sunset paddle. We left the cove and turned northward, working our way around Reed Point. It was now the evening low tide, so as we approached Moose Island it was connected to shore by a sandbar. Moose Island appeared to be privately owned, although there weren’t any No Trespassing signs. We paddled around the westerly side of the island admiring a couple of coves and sandy pocket beaches. We reached the north end of the island, but then it was time to turn around and get back to Seal Cove by dark. We had another fine sunset at our backs as we paddled back to the car. We also had a full moon at night after the sun went down. Another campfire at the campground and we were done for the day.